Scientists at JILA, a joint institute of the National Institute of Standards and Technology (NIST)and the University of Colorado at Boulder (CU-Boulder), have applied their expertise in ultracold atoms and lasers to produce the first high-density gas of ultracold molecules—two different atoms bonded together—that are both stable and capable of strong interactions. The long-sought milestone in physics has potential applications in quantum computing, precision measurement and designer chemistry. Described in the Sept. 18 issue of Science Express,* JILA's creation of ultracold "polar" molecules—featuring a positive electric charge at one end and a negative charge at the other—paves the way for controlled interactions of molecules separated by relatively long distances, offering a richer selection of features than is possible with individual atoms and potentially leading to new states of matter. "Ultracold polar molecules really represent now one of the hottest frontiers in physics," says NIST/JILA Fellow Jun Ye, an author of the paper. "They are potentially a new form of matter, a quantum gas with strong interactions that vary by direction and that you can control using external tools such as electric fields." The authors say atoms are like basketballs, round and somewhat featureless, whereas molecules are more like footballs, with angles, and characteristics that vary by direction. "This is really a big deal," says NIST/JILA Fellow Deborah Jin, another author of the new paper. "This is something people have been trying to do for a long time, using all kinds of different approaches." Jin and Ye are adjoint professors of physics at CU-Boulder and both teach undergraduate and graduate students. Other authors of the paper include a NIST theorist at the Joint Quantum Institute at the University of Maryland and a theorist at Temple University in Philadelphia. Two types of atoms are found in nature—fermions, which are made of an odd number of subatomic components (protons and neutrons), and bosons, made of an even number of subatomic components. The JILA group combined potassium and rubidium, which are different classes of atoms (a slightly negative fermion and a slightly positive boson, respectively). The resulting molecules exhibit a permanent and significant differential in electric charge, which, along with the ultracold temperatures and high density, allows the molecules to exert strong forces on each other. The molecules are in the lowest possible vibrational energy state and are not rotating, so they are relatively stable and easy to control. They also have what is considered a long lifespan for the quantum world, lasting about 30 milliseconds (thousandths of a second). JILA's ultracold polar gas has a density of 10 quadrillion molecules per cubic centimeter, a temperature of 350 nanoKelvin above absolute zero (about minus 273 degrees Celsius or minus 459 degrees Fahrenheit), and a measurable separation of electric charge. The process for making the molecules begins with a gas mixture of very cold potassium and rubidium atoms confined by a laser beam. By sweeping a precisely tuned magnetic field across the atoms, scientists create large, weakly bound molecules containing one atom of each type. This technique was pioneered by Jin in her 2003 demonstration of the world's first Fermi pair condensate. At this stage the molecules are very large and possess a high amount of internal energy, which allows them to decay and heat up rapidly, both undesirable effects for practical applications. The scientists faced the considerable challenge of efficiently converting atoms that are far apart into tightly bound molecules, without allowing the released binding energy to heat the gas. In a process that Jin describes as "chemistry without explosions," scientists used two lasers operating at different frequencies—each resonating with a different energy jump in the molecules—to convert the binding energy into light instead of heat. The molecules absorb near-infrared laser light and release red light. In the process, more than 80 percent of the molecules are converted, through an intermediate energy state, to the lowest and most stable energy level. A key to success was the development of detailed theory for the potassiumrubidium molecule's energy states to identify the appropriate intermediate state and select the laser colors for optimal control. In addition, both lasers were locked to an optical frequency comb, a precise measurement tool invented in part at NIST and JILA, synchronizing the two signals perfectly. The research described in Science is part of a larger NIST/JILA effort to develop techniques to understand and control the complex features of molecules and their interactions. 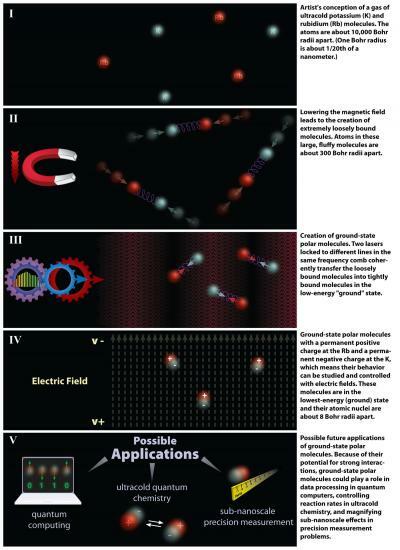 Practical benefits could include new chemical reactions and processes for making designer materials and improving energy production, new methods for quantum computing using charged molecules as quantum bits, new tools for precision measurement such as optical molecular clocks or molecular systems that enable searches for new theories of physics beyond the Standard Model, and improved understanding of condensed matter phenomena such as colossal magnetoresistance (for improved data storage and processing) and superconductivity (for perfectly efficient electric power transmission). JILA researchers are now working to improve the efficiency of producing tightly bound polar molecules and extend molecule lifetimes. They also plan to apply the new molecules to explore new scientific directions.